Prior to spring of 2015, Emory used about 1 million gallons of potable water every day, with nearly half of that put toward mechanical uses like heating and cooling. That’s a lot of drinkable water wasted—especially when California is experiencing a major drought and the Tri-State Water Wars are happening right here in Georgia. What changed in 2015? 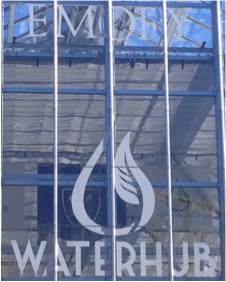 Emory’s multi-award winning facility WaterHub began operation. WaterHub reduced potable water usage 40% on campus by recycling wastewater, providing an alternative source of water for use in mechanical systems. This facility provides an important role in reusing and reclaiming water. The WaterHub is a triple win. Water entering the hub is routed directly from sewer lines, helping to reduce stress on wastewater treatment plants. 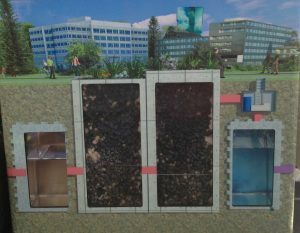 Emory pays for the recycled water that is produced, generating profits to support the facility while saving money compared to water costs from other sources. The environment is the third beneficiary! Let’s explore the process that creates such benefits! Imagine the water you find in a sewer. It’s pretty gross right? The WaterHub process removes all the gross and leaves the water looking clean. A lot of your gross vision of sewer water was due to visible contaminants, most of which is some form of solid waste. Screening devices filter out those solids, and the cleaner—but probably still very discolored water—moves on to the next phase of the process. 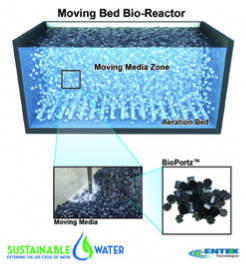 The wastewater flows through a series of moving bed bioreactors (or MBBR for short). These four tanks contain small plastic discs with holes, designed to provide the largest amount of surface area possible. Microbes grow on these plastic pieces, and they remove small contaminants and chemicals from the water. Surface area, surface area, surface area! That is a mantra you hear over and over in wastewater treatment. The greater the surface area, the bigger the number of microbes present, and the larger the amount of contaminants removed from a volume of water. The design of this system allows 400,000 gallons of water to be cleaned every day! 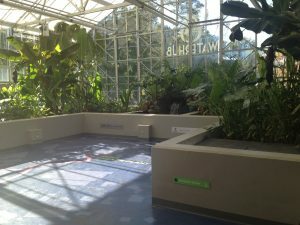 The “greenhouse” of the WaterHub. Photo taken during my visit. The next component is the hydroponic system, which makes a visit to the WaterHub feel like a greenhouse stroll. The water tanks are housed underneath a variety of green plants, allowing their roots to extend into the water. These root systems contribute a lot of surface area and provide a great habitat for microbe growth. Emory’s WaterHub is especially unique because it is actually two different water treatment systems. The greenhouse with the MBBR is the main one processing most of the water. A second smaller unit called the reciprocating wetlands cleans around 1200 gallons of water each day. Unlike the main system, the wetlands are outside and grow a different variety of plants. The plants still provide lots of surface area for microbial growth, but instead of continuous mixing like in the MBBR, the wetlands employ the concept of tides. There are two main basins using a series of 18 tides per day to move water throughout the process. After passing through one of these systems, most of the large-particulate contaminants have been removed. Water then travels very slowly through a clarifier to filter out fine particles with the help of chemical treatment. And next through a disc filter to remove the smallest particles. The water now passes the government’s test for being re-use quality! Just to be sure, the water moves through one last series of tanks where it is exposed to UV light, making it ultra clean. The WaterHub’s state-of-the-art techniques create a huge difference in water usage at Emory! Every day, thousands of gallons of drinking water are saved from the fate of being used for operating mechanical systems. All thanks to reclaimed water that is distributed to campus for the steam and chiller plants, and even to residence halls for toilet flushing. Recent news: the WaterHub team is exploring possibilities to expand the project to new sites and to apply the technology for other uses. 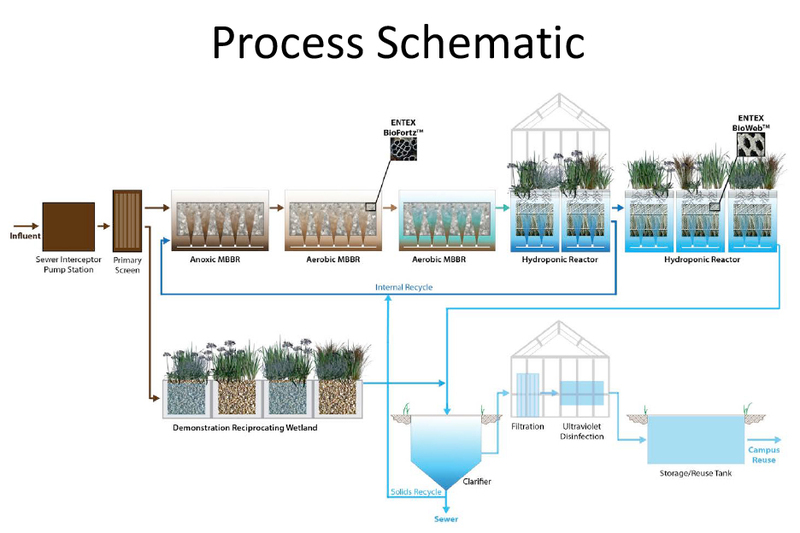 For example, Matt, the senior project manager who led our great tour, described how the reciprocating wetlands model could be used in developing countries as an effective but cheaper wastewater treatment mechanism. Eager to learn more about the WaterHub? Visit its website http://sustainablewater.com/waterhub/or explore the benefits and responsibilities of the WaterHub by clicking on an icon below.